Your local veterinarian in Irmo, SC! for your veterinary hospital appointment! It is our mission to treat each pet as if they are a member of our own family. We practice respect, courtesy, empathy and responsibility on a daily basis. We are happy to book an appointment for you! Contact us using our online form with dat s and times that are convenient for you and your pet, and one of our appointment coordinators will call you to confirm availability. Shop online from the comfort of your homes for all your pets needs. Thank you to our wonderful Dutch Fork Family for your support and trust! 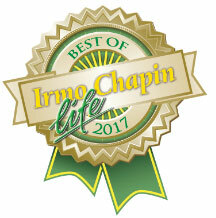 It’s because of you that we won Best of for both The State and Chapin-Irmo Life! We could not have done it without you! Thanks again!